With the dog in front of a broad jump, the dog must back up and change position before being sent over jump and returning to handler. Purpose: Demonstrate jumping skills, distance work, and verbal stimulus control. Equipment: Broad jump (see Rules & Judging section for definition), target (optional). Exercise set-up: The exercise begins when the dog is placed in a stay in any position, at an appropriate distance from the broad jump. Handler goes around the jump to a distance of 10 ft. (3 m) on the other side, turns and faces the dog. Handler then cues the dog to back up 2 ft. (0.6 m) to an optional target. A continuous backup cue is allowed. Dog is then given a single verbal and/or hand signal to a stationary position of the handler’s choice. 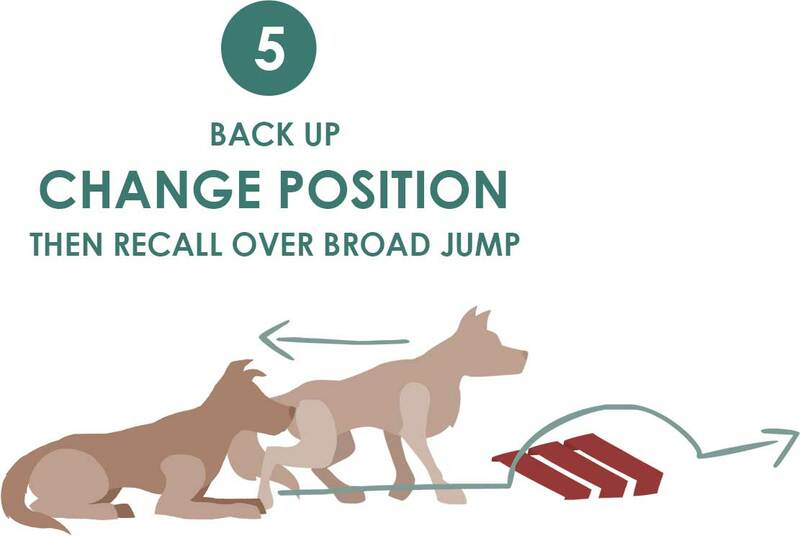 After the change in position, handler will call dog over the jump, followed by either a sit in front position or a direct finish to heel position (handler’s choice). The exercise ends when the dog stops in the final position in front of or next to the handler. Non-qualifiers: Dog does not stay in front of the jump when the handler leaves. Dog does not back up when cued, or requires excessively forceful cues to move backwards. Dog sits during the backup. Dog does not take the position cued by the handler after the backup or requires more than one cue to take that position. Dog does not jump when recalled. Dog steps on or in between the boards of the jump. Dog does not take a formal front or finish at the handler. Video does not permit the exercise to be adequately judged. Tip: Consider leaving your dog in a stand/stay at the broad jump, which makes backing up easier for some dogs.